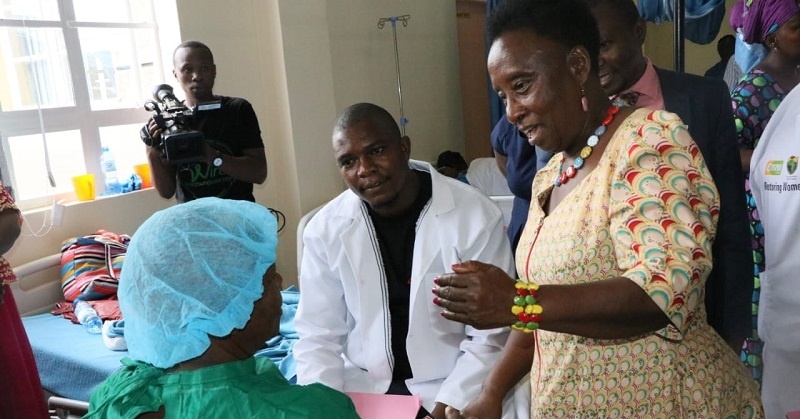 Over 50 women living with fistula related complications in Makueni County are expected to receive free surgeries and medical advice in a weeklong free Fistula Camp at the Makueni County Referral Hospital. The execrise which began last week Friday 29th and runs to April 6th was officially flagged off on Monday by Deputy Governor Adelina Mwau, Safaricom Foundation’s Assistant Programmes Analyst Antony Otieno and Council Member, Flying Doctors Society of Africa Illa Devani. The activity, courtesy of a partnership between the County Government, Safaricom Foundation and Flying Doctors’ Society of Africa aims at creating awareness about fistula and the importance of quality maternal health services. Since Friday, at least 100 women have been screened and 23 admitted at the Mother and Child Hospital, Wote, for surgeries which commenced on Monday. Accounts by some of the women admitted for surgery tell of a people who have been living in delibitating conditions with a near withdrawal from all social activities due to stigma. The Mother and Child Hospital Medical Superintendent Dr. Doris Mbithi said victims of this condition suffer from depression, rejection and trauma and choose to suffer in silence as the cost for corrective surgery is prohibitive to many. A normal corrective surgery costs at least Sh 65,000 and requires specialised medical procedures. The World Health Organization has termed fistula as the single most dramatic aftermath of neglected childbirth estimating that more than 2 million women live with fistula worldwide. It is estimated that there are 3,000 new fistula cases in Kenya each year, and only 7.5 percent of these are able to access medical care. This means that every year, more than 2,700 women with new fistula cases do not receive the necessary medical attention.